Click here for the 2018 Induction Schedule and Ticket Information. Many successful coaches in his sport are football minds who become great leaders. Lewis Cook was a great leader who eventually became one of the best high school football coaches the state has ever produced. The composure the 2018 Louisiana Sports Hall of Fame inductee has displayed on the sidelines of high school football games over the last four decades is now legendary. And so are his record, his winning tradition and perhaps most of all the respect he’s gained from his players, friends, colleagues and foes alike. Cook officially joins the state Hall of Fame Saturday, June 30, at the induction dinner and ceremony at the Natchitoches Events Center, a football field away from the five-year-old Hall of Fame Museum at 800 Front St.
As Prejean remembers, Cook’s leadership qualities were being displayed long before he ever imagined coaching in a game. “I can remember on the school grounds at Rayne High School when Lewie was in the ninth grade,” Prejean said. “If trouble broke out, all it took was for Lewie to walk out and say, ‘Enough,’ or that little nod he does and that was it. He broke it up. It’s just this special knack he’s got to make people feel comfortable. It’s because he’s so genuine. Don’t confuse his calm demeanor and composure for a lack of fire to compete, however. Still in his younger coaching days, Cook still dabbled in playing softball. Even after breaking his leg, Cook couldn’t stay away. Sure enough, in his first at-bat of this new just-for-fun league, Cook finds himself motoring into second base. Indeed, underneath his calm exterior is an intensity many overlook. In Cook’s mind, he’s a nice combination of each of his parents — Lewis Sr. and Josie. On one hand, there was his father’s high standards. His mother, meanwhile, didn’t sweat the details. “And with mom, it was, ‘Don’t worry about that stuff.’ My momma never took herself too seriously about anything. I remember she would get on my sisters, who would stay in front of the mirror for an hour to get ready for school, and she would tell them, ‘Nobody cares what y’all look like.’ Don’t worry about the little things. The result was an even-tempered young coach who just didn’t accept losing. In his 33 years as a head coach, Cook has led his teams to 31 playoff appearances, reaching the semifinals 18 times, the state finals 12 times and won four state championships. His career playoff record is 75-27. Only J.T. Curtis has more state runners-up appearances than Cook in Louisiana prep football history. His career record of 344-82 puts Cook as the third-winningest active coach ever behind Curtis and St. Thomas More’s Jim Hightower, as well as the No. 5 overall. Cook is only one win behind Don Shows in fourth place and 22 behind third-place Red Franklin of Haynesville. Dauterive detected a very young Cook had what it took to be successful. For the last two decades, few have witnessed the true greatness behind Cook’s success more than defensive coordinator James McCleary. McCleary first met Cook as a young graduate assistant in Cook’s second stint on the UL Lafayette coaching staff as offensive coordinator in the 1990s. Instead of looking at McCleary as a nuisance, Cook immediately took him under his wing. By that time, Cook had already turned Crowley High from a perennial loser into the Class 3A state champions in 1989. Then after playing a big role in the progress of future NFL standouts Jake Delhomme and Brandon Stokley as the Ragin’ Cajuns’ offensive coordinator from 1992-95, Cook returned to Acadia Parish to coach his three sons — Lewis III, Jeff and Stu — for the Notre Dame Pioneers. During his two decades at Notre Dame, Cook has a spectacular record of 244-37, including three state titles. 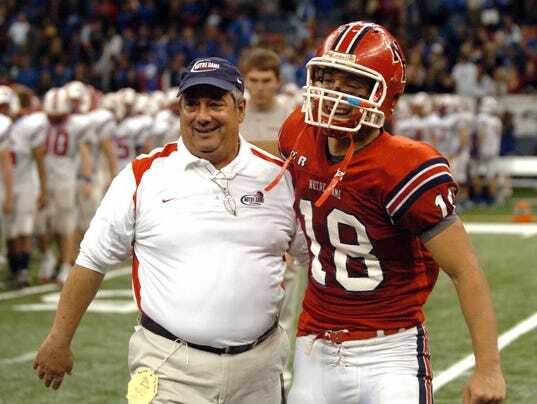 When he took the Pios to the Dome first time, Cook became the first coach to take two different teams to the Superdome Classic in the Dome era. Over the years, McCleary feels many confuse Cook’s lack of outward emotion. “I do think he is an emotional coach,” he said. “He does a good job of keeping it inside. He’s mentally ready and prepared to do the right things." That hidden emotion, however, rarely results in anger. “Maybe once a month, he’ll toss a hat, but he doesn’t really get angry,” Lewis Cook III said. “He doesn’t really yell. I’m on the head-sets with me, and I’m telling you in an entire season, he’ll raise his voice three times or less. Cook’s composure is also made easier to achieve because of his preparation. In many cases, a prolific high school football coach with those high leadership skills is scooped up by the collegiate level. After four seasons as Rayne High’s head coach, Cook did dabble in the college game as an assistant at his alma mater from 1981-84, and later spent four more seasons with the Ragin’ Cajuns a decade later. But Cook’s mind always drifted back to the high school game. “I kind of look at it as I guess I was always meant to be a high school coach,” Cook said. “I’ve always felt more comfortable compared to the eight years I had in college, although there’s the lure of college football. There’s always that temptation there. The 2018 Louisiana Sports Hall of Fame induction will be Saturday, June 30 at the Natchitoches Events Center. This is the fifth in a series off 11 profile features on this year’s induction class. The others in the class include, Paul Candies, Jerry Simmons, Steve Gleason, Scooter Hobbs, Jack Hains, Brandon Stokley, Russ Springer, Reggie Wayne, Larry Wright and Lyn Rollins. Please click here for Lewis' Athletic Network profile.